Last week, the fried chicken chain switched its delivery contract to DHL, which blamed "operational issues" for the supply disruption. "Our teams are working flat out all hours to get the rest back up and running as soon as possible - but it's too early to say how long it will take to clear the backlog." 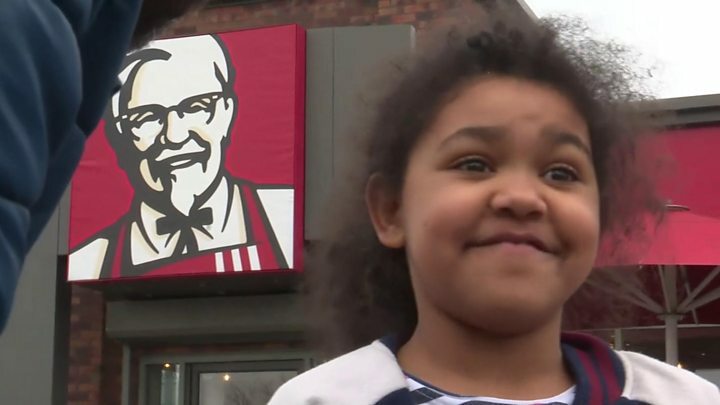 Until last Tuesday, KFC's chicken was delivered by South African-owned distribution group Bidvest, which describes itself as "the leading supplier of logistical and supply chain solutions to the UK hospitality and restaurant sector". But after the change in the contract, many of the food giant's outlets began running out of chicken products. "We've brought a new delivery partner onboard, but they've had a couple of teething problems - getting fresh chicken out to 900 restaurants across the country is pretty complex!" it added, apologising to customers for the inconvenience. "KFC are left with hundreds of restaurants closed while DHL try and run the whole operation out of one distribution centre. Three weeks ago, KFC knew they had made a terrible mistake, but by then it was too late." Should fast food be banned near schools?